As with a lot of other nutrition-related topics, health experts seem to go back and forth on their opinions of saturated fat. The increase in saturated fat in the diet has been blamed for an uptick in heart disease and stroke. We know that butter is about 51 percent saturated fat. And a 2016 study in the Journal of Clinical and Diagnostic Research suggests ghee is 60 to 70 percent saturated fat, making it potentially higher in saturated fat than butter. However, a 2010 study published in Ayu indicated the saturated fat content in ghee is only 48 percent. While neither butter nor ghee are going to make it on a top 10 list of health foods, is one healthier than the other? Sometimes referred to as clarified butter, ghee is traditionally used in Indian cooking. Ghee is derived from butter. It’s made by heating butter just long enough for the water to evaporate, after which the milk solids are filtered out, leaving only the fat. So ghee is often thought to be a purer, and therefore healthier, form of butter. Heart disease is increasing throughout the world and has become a public health concern. The saturated fat found in many foods, including ghee, have been implicated in this rise. Most of the studies on ghee have been done on animals with few human studies to draw actionable conclusions. However, some of the studies indicate that saturated fats may not be the sole cause for heart disease. 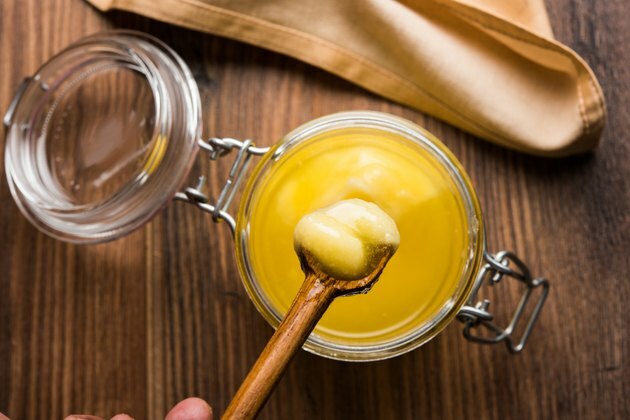 Up until a few decades ago, countries with a high amount of ghee in the diet had lower occurrences of heart disease. Those numbers seem to be increasing, and researchers are wondering if ghee is the culprit. Not exactly. The 2010 study in Ayu references previous studies in rats fed ghee diets, and their cholesterol levels and triglycerides decreased, but other studies were not able to duplicate the results. Human studies referenced were inconclusive, with one showing a decrease in cholesterol and another showing no difference. For those with lactose intolerance, ghee may be a welcomed substitution for butter. Lactose is the type of sugar found in dairy products, including butter. A 2015 study published in Molecular Genetics and Metabolism found that ghee had almost undetectable levels of lactose. The lactose levels in butter were 685 milligrams, and ghee samples had between 0.5 and 2.9 milligrams. Butter, just like ghee, is a source of saturated fat in the diet. While butter isn’t going to offer significant health benefits, it shouldn’t be praised or shunned. It’s a food that can be enjoyed alongside other healthy foods, such as whole grains and vegetables. Eating trans fat has been linked to an increased risk of coronary heart disease, according to a 2017 study in Nutrients. The USDA indicates that butter contains 0.47 grams of natural trans fat per tablespoon. There has been a shift in thinking in terms of types of fat. A 2015 study published in the American Journal of Clinical Nutrition showed that saturated fat in butter raised cholesterol levels, both good and bad, whereas trans fat raises bad cholesterol and lowers good cholesterol. It’s still better to choose unsaturated fats, such as olive oil, canola oil or avocados, but butter is a step above margarines containing trans fat. Butter is on more neutral territory these days in terms of health. While it doesn’t seem to increase or decrease the risk of heart disease, small amounts of butter in controlled studies have seen a reduced risk of Type 2 diabetes. 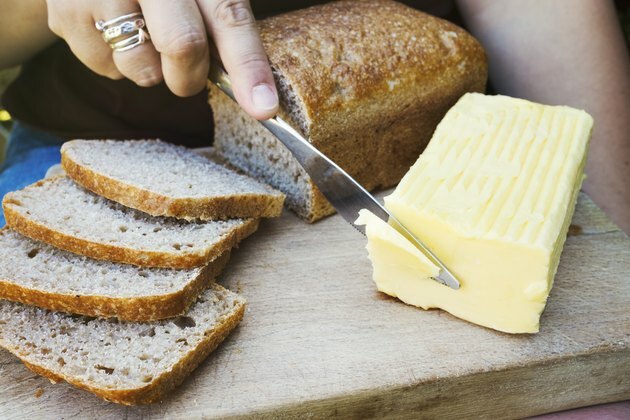 Researchers in a 2016 study in Plos One attributed the reduced risk to some of the nutritional properties of butter, including vitamin D content and a small link between full-fat dairy and increased insulin sensitivity. However, it’s important to note that the study didn’t compare butter with other fats, only with general foods in the diet. And the researchers make a point to add that, even with the findings, there’s no need to increase or decrease the amount of butter in the diet. The American Heart Association recommends that saturated fats, such as those found in butter, should comprise of no more than 5 to 6 percent of your daily caloric intake to maintain a healthy heart. For a 2,000-calorie diet, that’s 120 calories, or 13 grams, of saturated fat per day. A study published in the European Journal of Clinical Nutrition in 2005 found that when women consumed 40 grams of dairy fat in the form of butter (compared to dairy fat in the form of cheese), they experienced an increase in LDL cholesterol. For those already struggling with high cholesterol, it’s better to err on the side of consuming less butter. Keep in mind that cholesterol levels are not influenced only by isolated foods like butter or ghee, but by the diet as a whole. In addition, exercising regularly and not smoking can also help you maintain balanced cholesterol levels. The tides are changing when thinking about saturated fats. Instead of focusing on individual nutrients or individual foods, the whole diet needs to be considered. For those who wish to make a choice, it may come down to taste and function. Ghee has a nuttier and smoother flavor than butter. It also has a higher smoke point than butter, which means it can withstand higher temperatures, where butter may burn. Since butter and ghee are similar in terms of nutrition and implications for health, you don’t need to cut out butter or ghee completely. Instead, watch your intake and eat it in moderation. 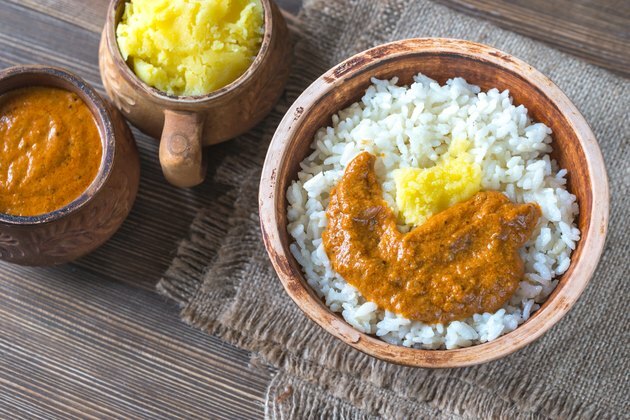 Do you eat ghee or butter? Had you heard of ghee before? Do you think you’ll try it now? If you’ve tried both, do you have a preference for one or the other? Did you know about the health benefits of ghee? Share your thoughts and questions in the comments below!